I have the prettiest bedroom set. I inherited it from my great aunt when she died. I believe the set is from the 50's or 60's. Anyway, the only problem is the bed is a full size. So, after I got married, I could still use the low and tall boy dressers, but I couldn't use the headboard and footboard. I still don't have a head board. 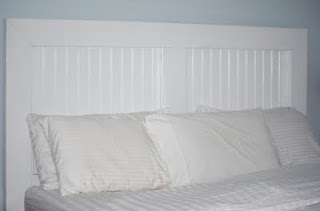 I came across this DIY headboard that I actually like. I have tons of beadboard left over from our kitchen remodel, so I can scratch that off the shopping list. I really like that--it looks better than the upholstered one I made last winter. I love beadboard, and yet have hardly any in my house. We think we need a table saw first to cut it all up. Any suggestions on good ones? Wow!! You guys are doing awesome! I twas good to talk to you through the fence yesterday! I REALLY like that headboard!